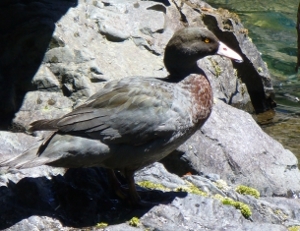 The whio/blue duck is Nationally Vulnerable and endemic at the species level. They have large territories along rivers and are getting wiped out by stoats, which are all over the mainland. There is very limited scope for rescuing some and transferring them to predator-free islands, since there is not much suitable river habitat on those small islands. We have to protect the scattered populations on mainland New Zealand, and the main thing we can do at the moment is trap stoats. This is incredibly expensive because many kilometres of trap line are needed even to protect a single pair. The Fyfe River is next to a key whio area in the Wangapeka which the government is trapping, and a Fyfe trap line may protect the remaining whio in the Fyfe and any future immigrants from the Wangapeka catchment. 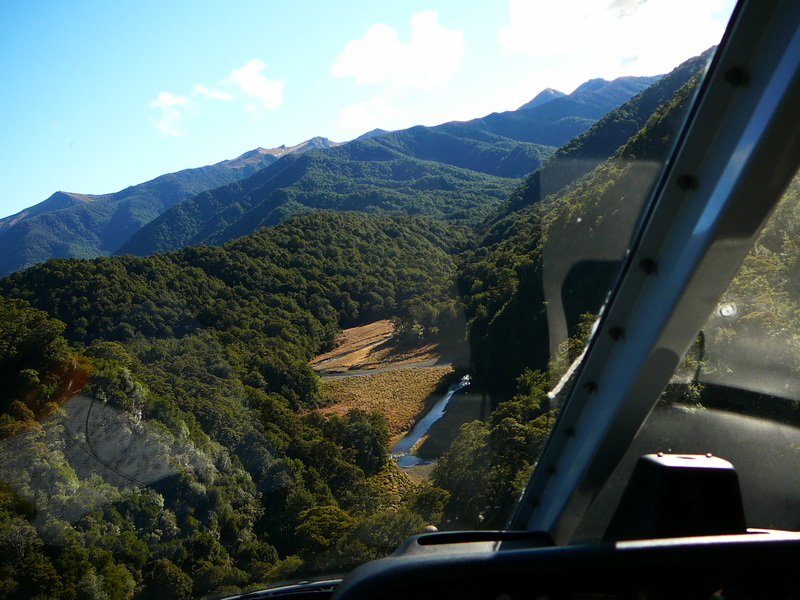 “On August 15th and 16th (2006), seven keen DOC workers flew into the Fyfe Valley with the task of deploying 102 traps for blue duck (whio) protection. Each person had the task of deploying a number of the traps alongside the river, at 100m spacings. Old frame packs were used to cart the traps (inside wooden tunnels) around, with the strongest of us carrying up to five at once! 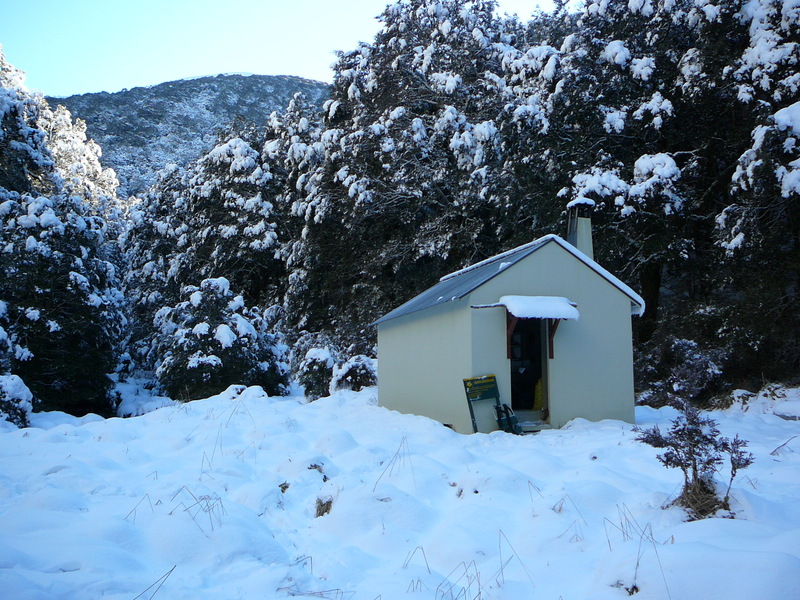 Three of us (myself included) worked at the hut end of the valley where the snow was knee deep but the fire kept us warm (well not freezing anyway) at night. The other four tented in the less snowy, but still cold, lower end of the Fyfe! So cold in fact, that one guy had to pour hot water into his boots the next morning to defrost them enough to get his feet into! DOC has undertaken to maintain the line in the future. Over 100 stoats were killed in the first two years. By 2009, Kate reported that the whio population on the Fyfe had doubled since trapping began, with the 4 breeding pairs producing 20 ducklings in that year. The Northern Ruahines are an outpost for whio and kiwi. DOC and private land owners wanted to team up to protect these species and enhance the conservation values of the beautiful forest and tussocklands in this area. The catchments of Ikawatea Stm, Mangatera River and Waiokotore Stm have been trapped since 2007 and a whio survey in 2009 found 44 adults and 34 ducklings, which was well in excess of any numbers found before trapping began. DOC’s Nobby Robson wanted to extend the protected area to the Apias River catchment. A baseline survey for whio was indicated so that future success can be measured. 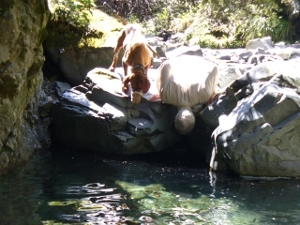 The team comprising Nobby Robson, Mark Caskey and species dog Snoopy surveyed the Apias and side creeks for four days in late spring 2010. 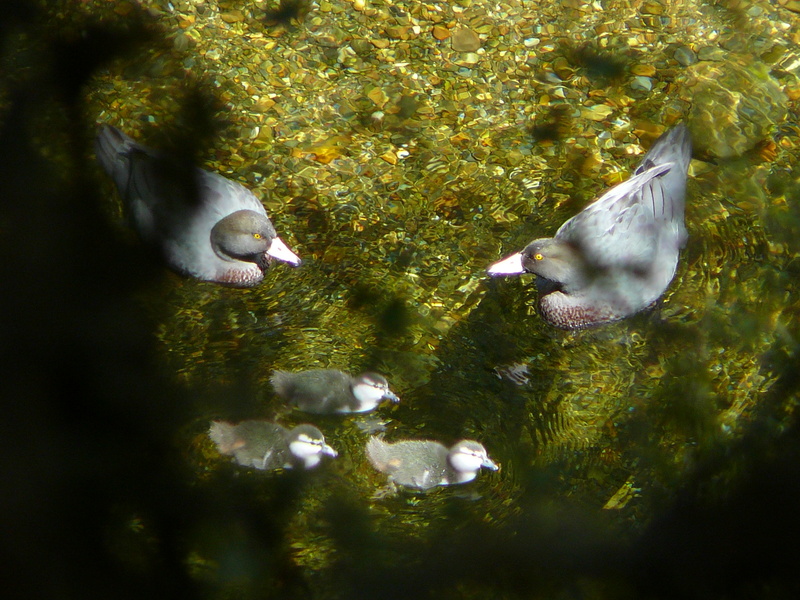 Twelve adult whio, including 2-3 pairs, were found, with no ducklings at all. The survey was timed for maximum visibility of any ducklings, but may have been somewhat confounded by late nesting due to big floods earlier. The likely explanation, however, was of a population in big trouble and headed for local extinction through lack of recruitment. Trap lines have now been installed and we hope for a similar recovery as was seen in the adjacent catchments. Other birds including kiwi, and bats, are also expected to benefit from this project. 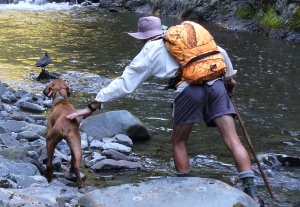 The Sandstone River runs parallel to the Fyfe River. Both have historically been strongholds for whio. The government’s money for whio did not stretch to the Sandstone and DOC discovered a stoat-killed whio in the river in 2007-2008. They were reasonably sure that that left only a single pair. Trapping might prevent the complete disappearance of whio from this area and provide an expansion area for the Wangapeka and Fyfe population. 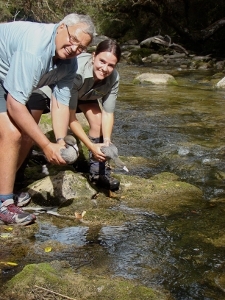 The overall aim is to secure a population of 50 whio pairs in the whole region by 2017. 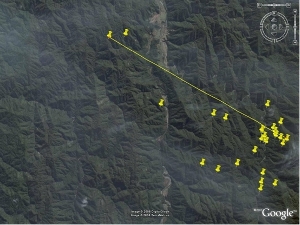 Kate Steffens reports that by late 2008, the track cutting team had completed a 7 km track/trap line up the length of the Sandstone, barring all but the top section which is probably unsuitable for whio. 70 baited DOC 150s inside weka-proof wooden tunnels were deployed shortly after. Traps are being maintained at the same time as the Fyfe line. Whio are now being reintroduced to the Sandstone through the “Whio Operation Nest Egg” program, involving collecting eggs from the wild, hatching them and raising them to release size in captivity, then re-introducing them to the wild (this aspect not funded by us). Juvenile whio can disperse 25 km from their natal site but very little is known about this process. Of course this can put them out of range of trapped areas. Satellite tracking may allow some vital information to be gathered. 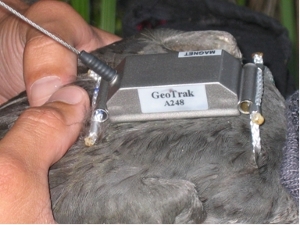 A joint DOC-Auckland University project in the Ureweras is using this technology and results show that the whio can be picked up several times per day and their location pinpointed (project co-funded only). A remnant population of whio is in upland Canterbury and the community has begun trapping to protect them. A baseline survey of whio numbers was needed to help evaluate the success of predator control in the future and allow best deployment of the community resource. DOC’s Malcolm Wiley organised the survey with specialist whio dogs and their handlers in summer 2011. Whio were encountered at a lower rate than hoped for, continuing the story of an adverse future for whio. It is possible that flooding in spring and summer made for a poor season and perhaps some birds moved to smaller side streams which were not surveyed. Based on the survey results and the sighting records for the past five years it is estimated that there are 6-12 pairs of whio in the area. The trapped areas are thought to be broadly in the right place and it is hoped that the community’s effort and commitment will allow whio to increase. 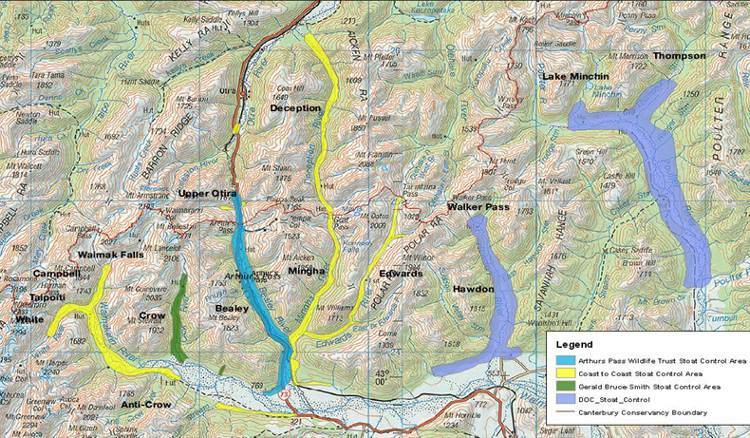 Depending on money, intensified trapping and periodic future surveys are intended also. 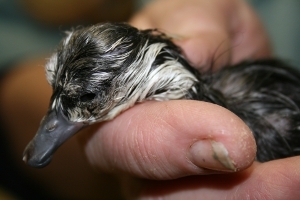 Mt Bruce National Wildlife Centre has an enviable record of pumping out captive-raised birds for reintroduction to the wild. We had an opportunity to assist with some refurbishments to benefit whio and other residents. First up, their incubator facilities needed an update. Manager Rosemary Vander Lee engineered an underspend, and surplus funds were used to convert two disused enclosures to ones suitable for raising of whio ducklings. A pump to provide their favoured fast-moving water, and some landscaping to make the pens look suitably riverine made for some happy whio. In 2008 Rosemary’s DOC team needed part-funding for a major refurbishment of their shore plover breeding facilities, to minimise outbreaks of avian pox and a nasty foot disorder. The money was used on an insect-proof aviary, replacement of gravel substrate in the outdoor aviaries and some work to improve water flow within them. We’ve also taken the opportunity to assist with accurate balances for weighing birds in a couple of locations. Funded by Fauna Recovery New Zealand ($52,000).